Proudly living up to their title, evergreens are a constant symbol of emerald beauty in our landscape. But when plagued by harsh weather or infestation in winter, evergreens can't showcase the glowing green we love. If you see your evergreens rocking an unsightly shade of brown, your trees aren't dead, but they do need some help! "After spending 15 years of my career caring for trees in New England, I've learned there are three reasons evergreens commonly turn brown in the winter," said Kevin Narbonne of Hartney Greymont, a Davey company. Problem: "Winter elements are notoriously tough on trees, but evergreens are especially vulnerable," Narbonne notes. 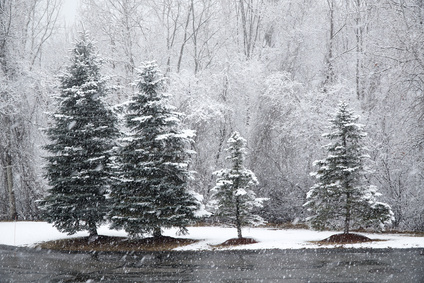 After the ground freezes, evergreens rely exclusively on the water stored in their needles. Once that water runs out, there's no backup supply, so their needles may turn brown and dry out. Solution: Narbonne recommends a protective spray to help evergreens suffering from dehydration. More info on this below. Problem: Take the already dry winter and add in the beating sun—now your trees' needles are even thirstier. "When this combo happens, your evergreens can get sunscald. Basically, the needles being hit by direct sunlight turn brown because they're losing even more water," says Narbonne. He explains that if this is severe, you may also see dead or dried areas of bark. Solution: To help with the dryness, Narbonne recommends trying an anti-desiccant spray. More on that below. If you suspect sunscald, wrap your trees' bark in burlap to keep them warm and protect them from the winter elements. Problem: Evergreens attract a few common pests and diseases, like the pine beetle or cytospora canker disease. Browning needles can be a symptom of infection or infestation. Also look for small holes, sawdust or large cankers leaking white sap on branches. Solution: If you suspect a pest or disease is to blame, Narbonne recommends calling in a certified arborist to pinpoint the problem and develop a course of action. Suspect problem #1 or #2? Learn more about this protective spray for evergreens. An anti-desiccant is a waxy coating that is sprayed on plants to shield them from moisture loss. Applying this in winter is said to safeguard trees until spring. For best results, Narbonne likes to wait until the temperature drops to 40-50° F. Before applying, he also checks that there's no rain in the forecast for at least 24 hours. Using the anti-desiccant spray in the right elements at the right time is essential to avoiding tree damage. Narbonne's team typically does a couple rounds of spraying the formula on dry needles, once in early winter and again in late winter. Then, your trees should be good to go for the season! 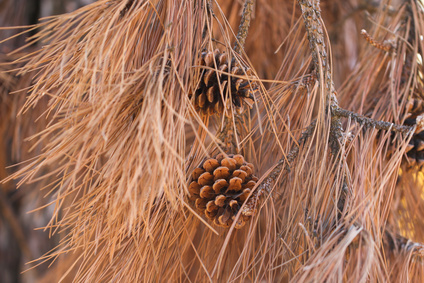 Follow these guidelines to help your evergreens look fresh and healthy all winter long! Contact Kevin Narbonne, or any of our local, certified arborists, for an official evaluation, diagnosis and treatment plan.